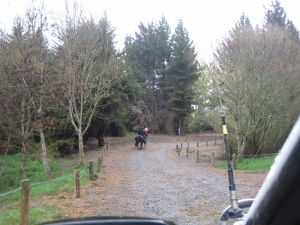 Baynons Brake is a series of horse riding trails that have been established by Environment Canterbury Regional Council on the northern Waimakariri river banks in the Clarkville area. They are part of the Waimakariri River Park and have tidied up and given purpose to an area that had been misused in the past by hoons in 4-wheel drives and the like. Space has been put side for parking horse floats and fencing has been put in. The area includes the stopbank in places and signposted trails that give riders a variety of choices in the area between the stopbank and the river. The facility was recently opened (in the rain!) despite the fact that the recent storm had done a lot of damage. Well done to David Owen and the crew at ECan!